Today (April 5, 2017) is Sri Rama Navami,the auspicious appearance day of Lord Sri Ramachandra. Lord Rama appeared in the month of Chaitra (March – April), on the ninth day of the growing moon (Chaitra Masa, Shukla Paksha, Navami Tithi). 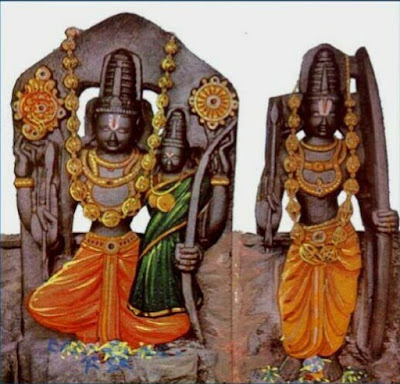 Sri Ramachandra appeared as the son of Dasharatha, the king of Ayodhya, who hailed from the dynasty of Maharaja Ikshvaku (also known as Raghu vamsha). 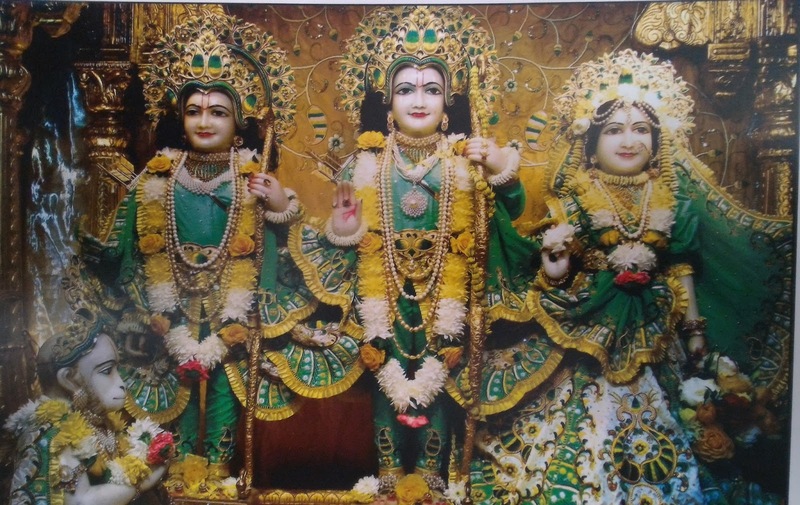 Sita,Ram,Lakshman, Hanuman at Bhaktivedanta Manor,Hertfordshire UK. Below lessons are extracted from a talk given by Radhanath Swami. *Attachment to service & not to the position*: Lord Ram was willing to become the king as a service to Maharaj Dasarath and He was willing to go to the forest as a service to His father. *Even extreme reversals if taken in the proper spirit will help us fulfill our mission in life:* For example, Law of gravity is only in effect in the Earth’s sphere and not beyond. So also, Laws of material nature act only in material consciousness not in spiritual consciousness. *Ram or Aaram(Hindi word for rest), A test for every seeker*: Citizens of Ayodhya wanted to go with Lord Ram to forest and leave behind all the comforts (Aaram) of the City Ayodhya. Sita, Ram, Lakshman at Bhadrachalam, Telangana, India. *(Sometimes) Saintly persons might cause pain to others, not to hurt them but benefit them:* Bharat disowns Kaikeyi, or Prahlad disregards Hiranyakashipu, a Doctor may cause pain (operation) to patient to cure him. Goal is to please the Lord: For Bharat, he wanted to stay in the forest that was easier than to return and rule the Kingdom but he did it to please Lord Ram. *Lord is the Proprietor*: Bhoktaram Yajna tapasam (Bhagavad Gita 5.29). Bharat was ruling the kingdom on Lord Ram’s behalf by keeping the Paduka’s (Footwear of Lord Rama) on the Throne. We are only caretakers, He is the real proprietor, and He can give and take away. The Caretaker acts according to the will of the owner. *Bhakti (Sita) cannot be achieved by Deception:* Ravana wanted to kidnap Sitadevi by deception, but he gets Maya-Sita at the end. Greed and lust are never satiated, they lead to arrogance and envy.Attachments can creates traps and make us suffer: Marichi takes up a golden dear form to which Sitadevi developed deep attachment to have it and thus trapped Sitadevi. We should see the substance through the eyes of the scripture. Marichi was all about false promises. For example, spider web is most attractive to the fly but actually, it is a trap. *Patience, Determination & Enthusiasm*: Example of Shabari. Long time ago, Guru had asked her to wait for Lord Ram while all other disciples and Guru himself went back to Godhead. She showed her enthusiasm by working hard every day to clean the place, plucking flowers & fruits for the Lord. She had complete faith in the words of Guru and patiently waited with determination. *The Lord reveals only when He wants. Honesty, we cannot put a facade before the Lord:* Hanumanji disguises when he went to meet Lord Ram. Lord knows within who we are, we have to be honest to receive the mercy of the Lord. Lord Ram did not speak to Hanuman for four months. *Obstacles on the path of Bhakti*: The demons who came to stop Hanuman during his jumping across the ocean. Mainaka (Gold Mountain) - temptation to seek comfort before achieving our real purpose. Simhika (Shadow catching demoness) - While striving for Bhakti, people will chastise, criticize and misunderstand us, we should have the willingness to tolerate. Surasa (Serpent): Being envious of people in higher position and try to stop their progress. This is jealousy of the mind. By devotional service, we have to devour Simhika who represents Envy. *Arrogance cannot understand well-wishers: The world is a mirror of our own consciousness. Ravana was thinking Mandodari was envious of Sita, but actually, he was envious of Lord Ram. Ravana was thinking Vibhisana was disloyal and taking the side of Lord Ram, but he was disloyal to Kubera, his cousin brother. When we think we know, we are not willing to listen to good counsel. Spiritual progress means simplicity and humility. If they are lacking, we will not listen thinking that we know better, that was Ravana. *Big or Small, we can swim the ocean of Samsara by chanting Lord Ram’s holy name*: Big or Small, all the stones floated by writing Lord Ram’s name.Pride or Attachment leads to loss of intelligence: dhyayato visayan pumsah (Bhagavad Gita 2.62). Ravana exhibited every stage of this sloka. Loss of intelligence - Even when all his stalwart warriors including Kumbakarna, Indrajit died but he still did not give up. *Hearing about the Lord - Revival of dormant love:* Lord Ram being Paramatma in the heart of everyone including Ravana could have killed him just by turning off Ravana’s heart. However, the Lord and His pleasure potency Sitadevi went through this whole ordeal so that we can hear about the Lord and revive our dormant love. *Counsel and Advise in battle against Illusion*: In battle against Illusion, at every stage association of devotees to put us straight without which we will fall. Lord Ram does not need but takes the counsel of Vibhishana. *Grace of a Sadhu needed to kill demons within* Agastya muni had given a divine arrow to Lord Ram. That arrow was used by Lord Ram to kill Ravan by piercing his heart. *Welcoming the Lord in hearts with lamps*: That is Dipavali festival. Lord Ram is welcomed back into Ayodhya with lamps. Dipavali is not just physical fire but lighting the hearts with light of Lord’s grace and process of devotional service. When heart is fully illuminated, then we can experience Lord Ram within ourselves. When our love awakens. Then Ramrajya is awakened within the heart and then without (i.e. out in the world). Jai Shree Ram!